Dental implants are changing the way people live! Let the experienced, Artisan Dentistry implant dentist help you rediscover the comfort and confidence to eat, speak, laugh and enjoy life. After all, everyone deserves a perfect smile. At Artisan Dentistry dental implants consist of tiny titanium posts which are placed into the jawbone where teeth are missing. The bone bonds with the titanium, creating a strong foundation for artificial teeth. Before dental implants, there were no fixed solutions available for people who lost all their teeth. Today, the dentists at Artisan Dentistry can replace a full jaw with dental implants or a fixed bridge that results in a permanent, stable and highly aesthetic solution. Dental implants are the most permanent solution to missing teeth. The benefits of dental implants go beyond the aesthetic, they can also help prevent bone deterioration and preserve your facial structure. The professional team at Artisan Dentistry makes the dental implant process easy. Artisan Dentistry continually works with the top implant providers to offer you the latest technology and techniques. 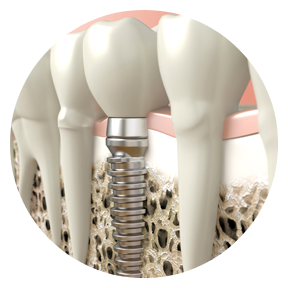 We guide you through each step of the implant process, from placing the dental implant to restoring the final tooth. Find out why patients from all over New England come to Dr. Mathew for their dental implants. Contact us today for your implant consultation. The benefits of teeth implants go beyond the aesthetic, they can also help prevent bone deterioration and preserve your facial structure.